Little nervous about pulling a travel trailer? Want to keep your current trusty SUV or duty truck? The Grand Design Imagine travel trailer will erase your worries. With floorplans starting well under 6,000-pounds, Imagine travel trailers are the answer to making sure you are comfortable before you set out on your next family vacation. Need more assurance? There is also a backup camera to help you squeeze into those tight spots. You will be a pro at pulling the Grand Design Imagine travel trailer in no time! The Grand Design Imagine is light, airy and easy to pull. Now let’s talk about the fun stuff. 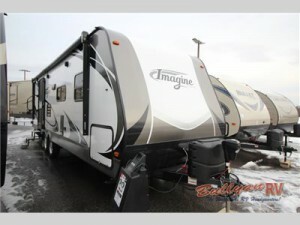 The Grand Design Imagine travel trailer does not disappoint! 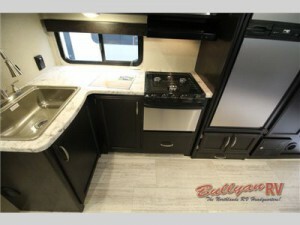 As you enter the Imagine travel trailer, notice the super efficient kitchen. Whipping up morning waffles in this kitchen will be a breeze. With a double door refrigerator, stainless steel three burner range with oven, and stainless steel microwave, gourmet meals can be a reality in your new home away from home. This kitchen might be nicer than your kitchen at home! Game night trophies are won right here! Relax on the comfy furniture in the living room. 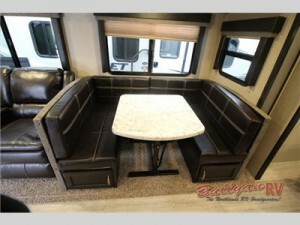 The u-shaped dinette is perfect for game night or a full family meal. There is an entertainment center so you don’t ever miss the game or your favorite movie, even on the road. The comfort and style continues into the bathroom. With a residential sized shower and beautiful cabinets for storage, you will be clean and relaxed after a nice, hot shower. Storage and privacy are king in the master bedroom. With a comfortable bed and oversized underbed storage, you will be sure to have plenty of room to store clothes for any occasion your travels lead you to. In case you are not quite ready to sleep, there is also tv and cable prep included. Before you go on your next family vacation, find out how much better it can be in the Grand Design Imagine travel trailer. Contact us to find out more information!